Warning – this will be a remarkably morbid post considering that it’s New Year’s Eve. 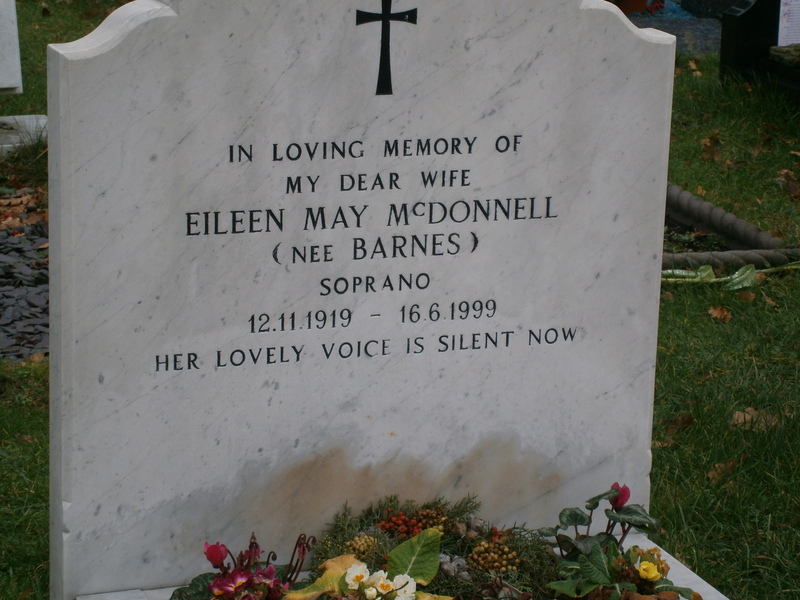 I also hope that none of the families of the graves I photographed will mind. I left my house with the intention to walk until I got lost and/or inspired, and then to get unlost but hopefully not uninspired. I managed the lost part quite quickly, and even worked out a basic synopsis in my head (which, as you might know, is what I was working on), but then found myself unlost. Please note that I am well aware that ‘unlost’ is not a word; however, it suits my purposes better than ‘found’. I took a turning, and then another turning, and followed a few tracks that were just dead ends, and was about to give up and go home when I found the path leading to the Green Chain Walk, which leads through the area most like countryside within walking distance of my house. I followed it, and kept following it, and eventually I came to a cemetery. Since I was trying to get inspiration and my book is basically a tragedy (although fewer people died in this draft than in the one before), I decided to go in. As a general rule, graves tend to pay tribute to the best parts of people – their gifts and their strengths. 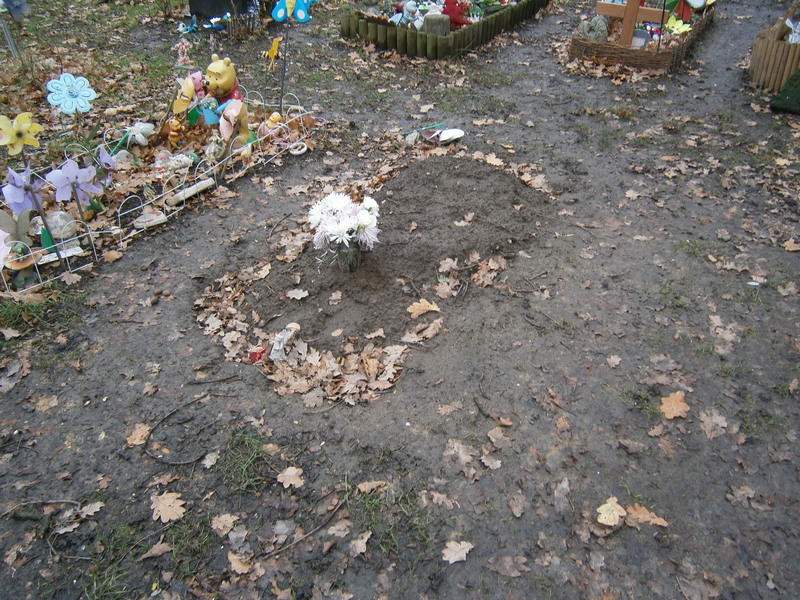 However, I hadn’t been there long when I came across the area dedicated to the graves of children and infants. 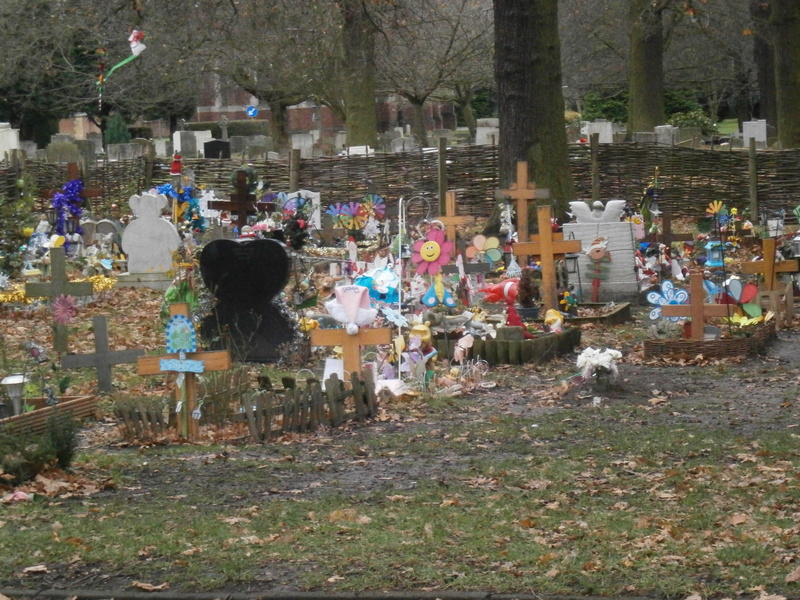 It was remarkably colourful compared to the rest of the graveyard, and was filled with toys, coloured windmills and other messages of love. Personally, I found it incredibly moving. As a general rule, I find cemeteries to be peaceful, and often beautiful, places. In the sunlight, they can have a certain stillness that you don’t get anywhere else. Today was a rather dreary day, mild for the time of year but not particularly pretty. I did not find this part of the cemetery peaceful. Some of the graves weren’t even marked, whether because the child had not lived long enough to be named or for some other reason I do not know. Others were covered with toys and messages from family members, stones with inscriptions, and flowers. I found myself welling up as I looked at them: there were so many. That was what got to me. 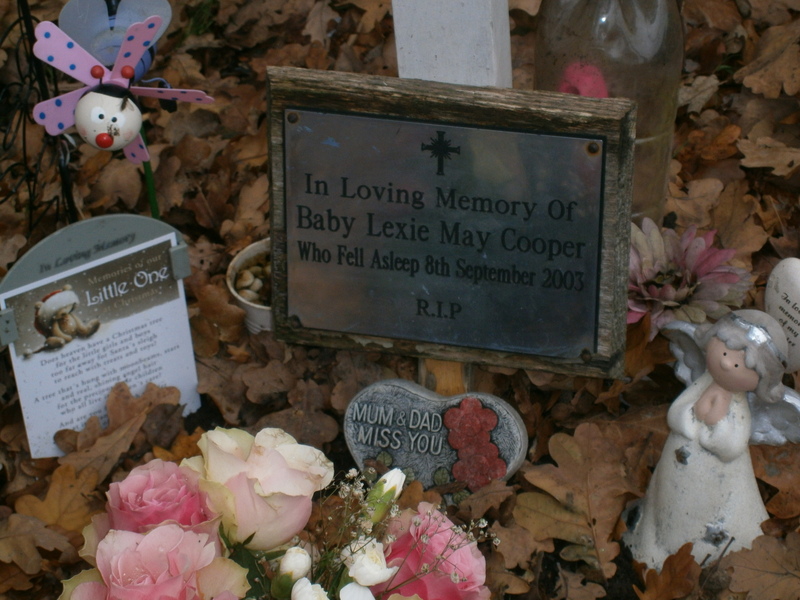 So many tiny headstones with ‘our little angel’ or ‘who was born sleeping’. It really got to me after a little while. 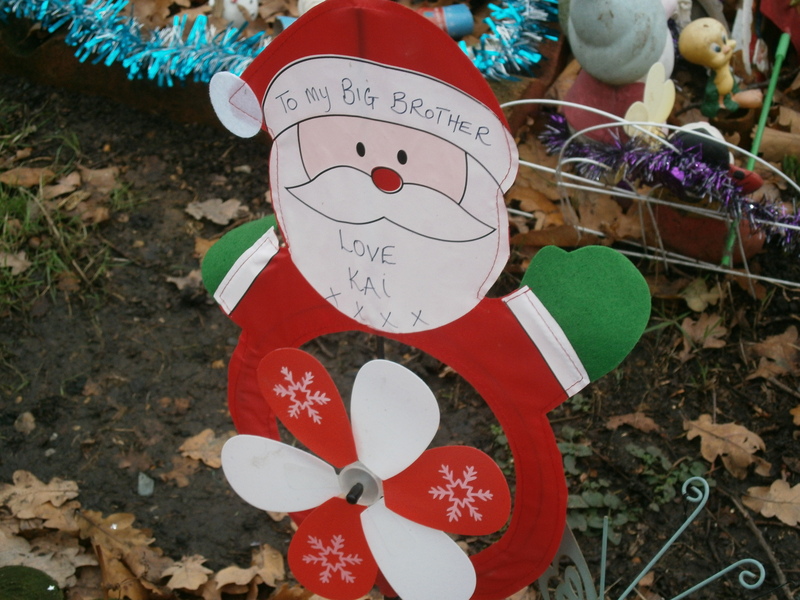 This was left on the grave of a child only a few months old, which would suggest that whoever left this message had never met their older brother. I couldn’t stand it any more, and I left. I wandered around the other graves for a while, and eventually found a path that I thought would lead me out of the cemetery, but it didn’t. 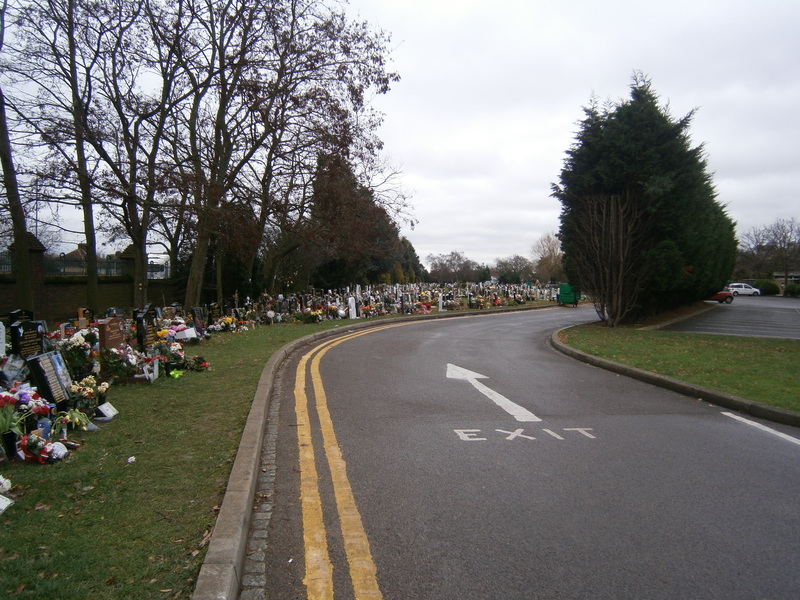 Instead I found myself in another area, containing a car park, and so many more graves. There had been resting places of all ages in the main area of the cemetery, dating back to the war or from last year. However, this other area had so many more recent ones. Some of the inscriptions made me cry. I haven’t taken too many photos of individual stones, and I shan’t put them all up here, because I don’t want to upset any families. But there is an enormous difference between the headstone of somebody who lived to be 80 or 100 and the headstone of a baby, a child, a teenager, a 27-year-old mother or 36-year-old father. And I saw all of those. Some of them had poems, others had verses from the Bible. Some were covered in flowers, or had a Christmas card perched forlornly (and often soggily) on one corner. A few had visitors, and I felt like an imposter, wandering around with my camera when I didn’t know anybody in the cemetery. In my defence, I hadn’t intended to end up there, but I still felt out of place. Instead of inspired, I was beginning to feel incredibly mortal. I turned away, and tried to find my way out of the graveyard in a direction that wouldn’t lead me straight onto a main road, because I had no desire to join the sleeping ranks. As I struggled to work out which path was leading in the right direction, I began to notice things about the stones and their inscriptions that I hadn’t seen before. So many of the stones had something positive to say that I began to see them for what they were. Markers, that was all, markers of where people had been. They weren’t there any more. There weren’t thoughts and hopes and dreams buried in the mud beneath me, there were shells. The real people, who weren’t here any more, were at rest, reunited with their loved ones. And some of the inscriptions were positively beautiful. 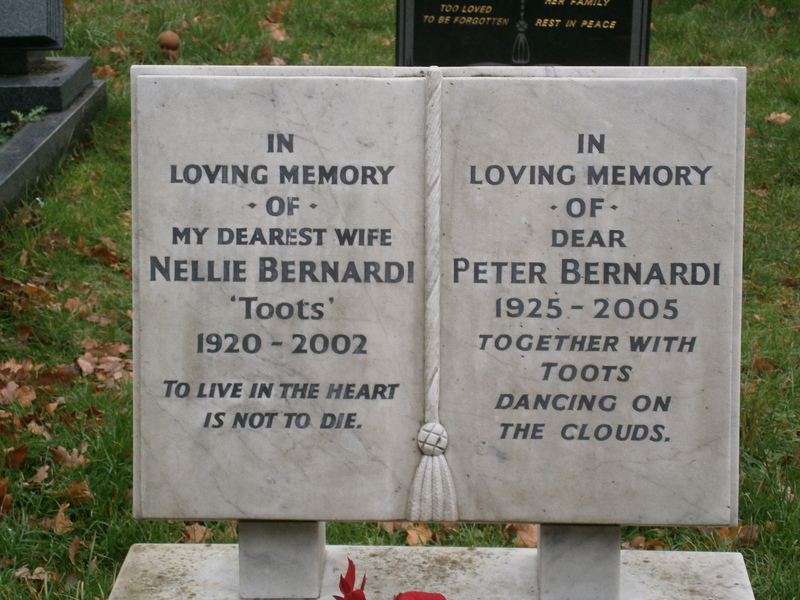 I’ve always been fond of graveyards – call me weird, but I like to look at the tombstones too, and the peace is nice. And like you said, I’m one of those people who reckons they’ve all moved on and are currently chillin’ out wherever you go when you hop the twig. Ha ha, if you die before me I am totally organising your funeral, because I have a pretty good idea what you’d like it to be like. This was a really moving post. I have never been to a cemetary this big I think, even though I am quite fond of them. For some reason they make me feel alive and fragile at the same time. It’s good to see that all the thoughts you had there did not make you leave the place completely depressed. And the video you made totally inspired me to go for walks more often, i think I should make this a new year’s resolution or something. Yes, I was feeling like I ought to go for walks more often. For about an hour and a half of my two and a half hour walk (that was an accident! I intended to go out for an hour *grin*) I was just wandering around with this massive grin on my face, wondering where I was going. Then I got to the cemetery and my feet started to hurt and I realised that without a bus pass I would have to walk all the way home, but I don’t regret it. I needed the fresh air and the break from staring at a computer screen, and I thought so much about life that I think I learned a lot. very touching. It’s amazing how vibrant the kids are even in death. I know I teared up, especially at that last kid’s grave you have pictured. I’m actually one of those who had an older sibling, they never got to meet. his name was Eric, but I’ve never been to his grave much. It probably doesn’t help that he was buried on my mother’s family plot, which I live no where near. even when we lived close by we never visited there much. Instead I often walked to the graveyard by my house. You could almost see it from the corner of my yard. It was bordered by the road that lead to the small public beach and a wooded park. I would walk in there telling myself stories, for hours. I love the older gravestones from eras gone by. At eh Quaker Meeting house I attended fro a while, I’d walk in its graveyard and admire some of the art work.